This Lebanese Salmon Dish has shot up right into the top 10 all time favorite salmon recipes. It has a sweet and sour taste to it. I never thought that lemon and pomegranate could go so well together. I made it for myself, as my husband was away for work, and I was looking for a quick recipe that is healthy and would lasts me for a coupe of days. I have to admit that I do not cook as much if I have nobody to share my meals with me. On the plus side I had a lot of restaurant meals that week, catching up with old friends and tasting food I never would have thought of making myself. I ate the salmon with some brown rice, in which I mixed in the rest of the pomegranate seeds to give it an extra crunch. Thinking about it now I think this dish would work well with some Tabbouleh and Pita Bread. 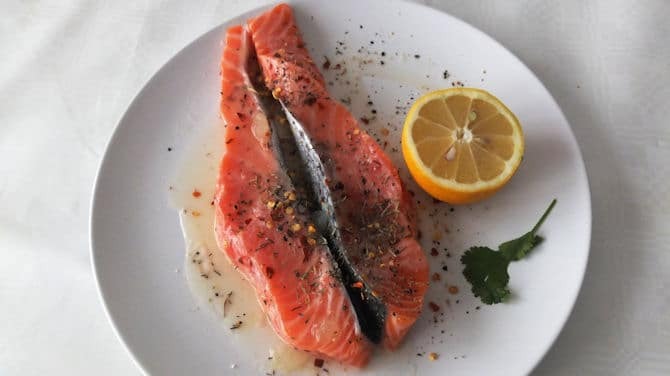 Lay salmon fillets out on a plate and drizzle with the lemon juice. Add thyme and season with salt and pepper and leave to marinade for about 30 minutes. Heat a large frying pan until hot and add the oil. Place the salmon in the pan, skin-side down if possible. Halve the lemon and add to the pan at the same time putting them cutside down. Cook for about 5-8 minutes until the salmon skin is crispy and turn and cook on the other side until done. Taste to check the balance of sweet and sour is right. Serve the salmon by sprinkling of the pomegranate seeds and few chopped fresh mint leaves. 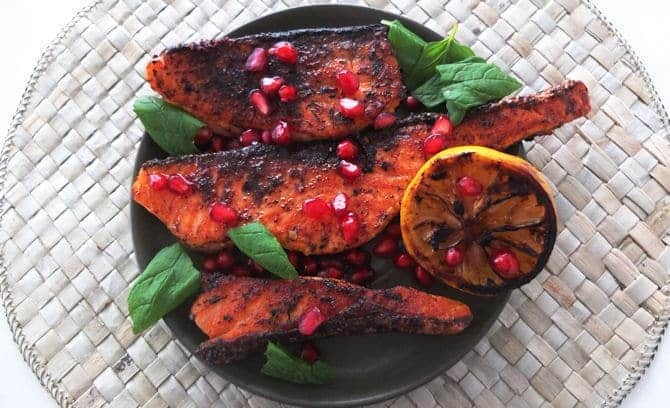 6 Responses to "Lebanese Salmon with a Pomegranate Molasses Glaze"